February 6, 2015 (San Diego’s East County) – The current measles epidemic has focused attention on concerns over parents who decline to vaccinate their children. 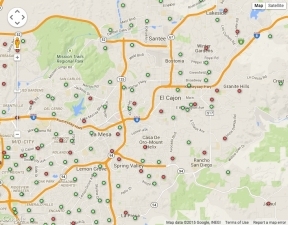 In East County and San Diego’s inland region (East of I-15) the rate of unvaccinated children in local kindergartens is as high as 90% (at Holy Trinity, a private school in El Cajon) down to just 1% unvaccinated at Mt. Vernon Elementary in Lemon Grove. Countywide, the rate of kindergartners who are unvaccinated or not current on vaccine boosters is 7.6%.